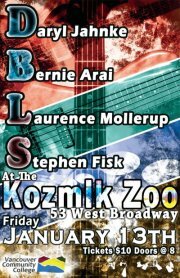 Daryl Jahnke, Bernie Arai, Laurence Mollerup, and Stephen Fisk play original, intense music to elevate your New Year! This entry was posted in Shows by nelucky. Bookmark the permalink.